Like skiing, snowboarding requires full body strength, agility and endurance. However the demands do differ between the sports and a key, often overlooked, area is the calf and ankle complex. The muscles of the lower leg need endurance, to continually make small, fine adjustments to constantly provide tilt and varying amounts of edge on your snowboard. And strength for more explosive actions for driving the board in powder, carving and hitting the park! Have a look at developing some of these exercises on a weekly basis into your pre-season training. Start off by working from a neutral foot, push though the calves to raise the heels as high as possible. Progress by holding some light hand weights (or tins of baked beans at home). Progress the exercise by balancing the heels off the edge of a step, allow the heel to drop down, and then push all the way up throughout the movement. 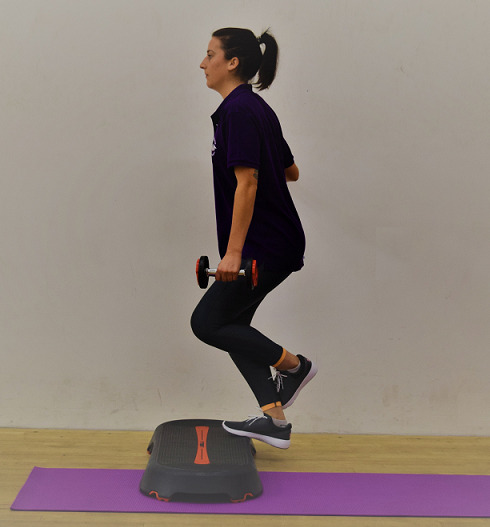 This includes an eccentric element, where the muscles lengthen as well as shorten – similar to being on your toe edge on a board. Once you can do this with 2 feet, progress to single leg raises. This is focused on the soleus muscle, which lies deeper in your calf, and will be working a lot while snowboarding. To target this muscle, follow the same exercise as above, but this time maintain a small bend in the knee. All the above exercises can be done with light weight/body weight with high reps to work on endurance. For example 15 reps x3. Or to work on more strength add some more weight and complete, for example, 6 reps x3. For good snowboarding control, the muscles at the front of the lower leg (the tibialis anterior) need to be strong too. Commencing with some simple toe taps will start firing these muscles – they don’t take much to become fatigued, so get tapping while sat at the computer! Try 20 seconds on, 10 seconds off - repeated x5 each side. Use a band or exercise weight, as shown in the photo here, to provide more resistance. Finally, it’s important to stretch the calf complex to allow the muscles to work effectively through their range of motion. Again, both muscles in the calf need stretching, so carry out the exercise opposite - one with the back knee straight and one with the back knee bent. To be effective hold each stretch 30 seconds x3. Straight after being on the hill when the muscles are warm is also an ideal time to stretch these muscles. Finally self-massage, with a roller for example, will help release tension in the calves, therefore helping with ankle range of motion and may help to reduce injury. All of these exercises are good for developing general fitness of the lower leg, but also if you are recovering from Achilles tendonitis, plantarfacitis or ankle sprains. Another great way to avoid any niggles is to have regular massage – just half an hour will greatly help release these muscles, prepare them for the hill and help reduce likelihood of injury. At Bonne Santé we offer a range of massages to help - not only with tired muscles, strains, aches and pains but also relaxation too! If you prefer the more tailored approach, get in touch with us at Bonne Santé to develop an individualised programme.